Clomid and infertility are mentioned so often together in a sentence, because Clomid is one of the most effective, and definitely most heard of fertility drug on the market today. The reason behind Clomid’s popularity is a good one. Somewhere in the neighborhood of 25% of all female infertility is caused by issues surrounding ovulation. Clomiphene citrate (Clomid again) offers a simple to take (swallowed in pill form, no shots) and has a relatively low number of side effects. Clomid is also relatively inexpensive when your basis of comparison are other fertility medications or treatments. The effective rate of Clomid is also pretty high. Somewhere around 80% of women experience effective ovulation when taking this drug. For the purposes of keeping things simple around this article, from now on I’ll just use Clomid for any references to clomiphene citrate. The main reason for this is that most people will recognize it’s market name way before it’s actual name. What situations are right for Clomid? Situations that call for Clomid generally arise when issues involving ovulation come up, but the fallopian tubes are all in order. If the fallopian tubes are blocked there’d be no point of inducing ovulation. The sperm would have no way to rendezvous with the egg. Clomid will usually be tried first if a women is experiencing anovulatory cycles or irregular cycles. Anovulatory cycles are menstruation that lack ovulation, and are usually helped with Clomid. Other common arenas for Clomid arise when polycystic ovarian syndrome (PCOS) causes fertility issues. 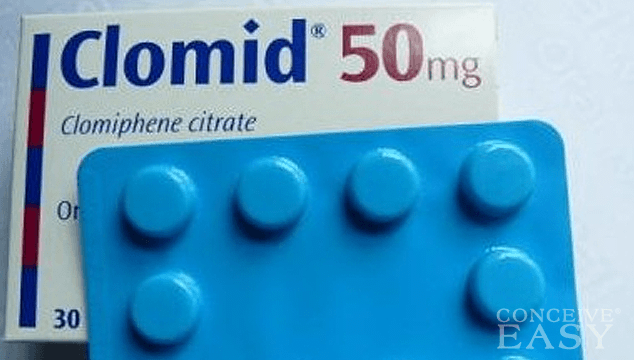 When a couple isn’t interested in trying extremely expensive and invasive treatments Clomid is often prescribed. In the case of unexplained infertility it may be subscribed just as a general solution. Each physician has a set of rules for taking Clomid that may be a bit different. Just be sure to ask questions about your physicians instructions, and follow them accurately. That being said, doses of Clomid are usually prescribed in the 50 mg size. This 50 mg tablet will be ingested for five days, only on days three to seven of your menstrual cycle. An alternative to taking it on days three through seven is taking it on days five through nine. This timeline is given with the assumption that the first day of your cycle is when heavier menstrual bleeding occurs, versus light spotting. Studies have shown pregnancy rates to be nearly equivalent on a variety of different dosage plans, so stick to your doctor’s instructions even if they vary from something you’ve read or heard.